You can substitute the spelt with wheat grain. Roast the flaked almonds in a dry frying pan until lightly roasted. Put aside. Cook the spelt grain following the instructions on the packet and put aside. Grate the carrots. Heat half of the oil and fry the carrots with the curry powder for around 2 minutes. Peel the grapefruit, including the white parts, with a sharp knife and separate the segments. Keep the juice! Tear the mint and basil. Mix together the spelt grain, red onion, mint, basil and carrots, the rest of the olive oil and the grapefruit juice. 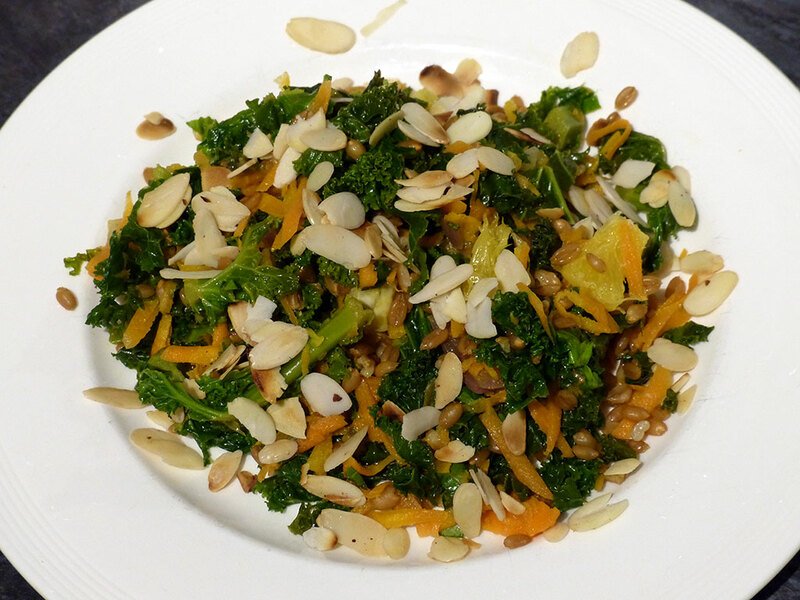 Decorate with curly kale, roasted flaked almonds and pomegranate apple seeds. Top Tip: you can prepare this recipe the day before. Just leave the decoration to the day you intend to eat it! Also, you can substitute the spelt with wheat grain.